Jorge Santiesteban has been getting some attention with his ’64 SS at shows down in San Diego, California, especially with the ride’s simplified hydraulics setup. When Jorge got started, he wanted a practical trunk that would cater to his needs. Jorge had a vision and he went over to Big Kid Hydraulics in San Diego to make that vision a reality. The result is a super-clean setup, which can be harder to build as sometimes less is more. “Big Eddie” and Manny ran with the idea that Jorge had and never turned back. The trunk received eight 31-series batteries to power up the two Red’s Hydraulics Show Series pumps. The pumps received a custom rack that was painted by fellow Individuals club member Armando at Nice & Easy Customs. Before everything was bolted down, the pumps were chrome plated and the four Adex dumps were polished to a show finish by Romero’s Chrome & Polish. Once it was all put together, everything was ready to go, including the chrome solenoids that were used for the setup. The rear panel was made by Jorge’s dad, “Tito,” who wrapped it in vinyl to match the interior of the car. Jorge tells us that could not have put together his setup without the support of his club and family. We hope to see this clean ’64 in Lowrider once Jorge is ready for his shoot. Until then, keep your eyes open for him down in San Diego. BumpsOwner”Mr. Cartoon”Vehicle’62 Chevy ImpalaCity/StateLos Angeles, CaliforniaClubLifestyle C.C. “Mr. Cartoon” has been riding for years and this ’62 convertible is just one of the few cruisers that he’s owned in his lifetime. 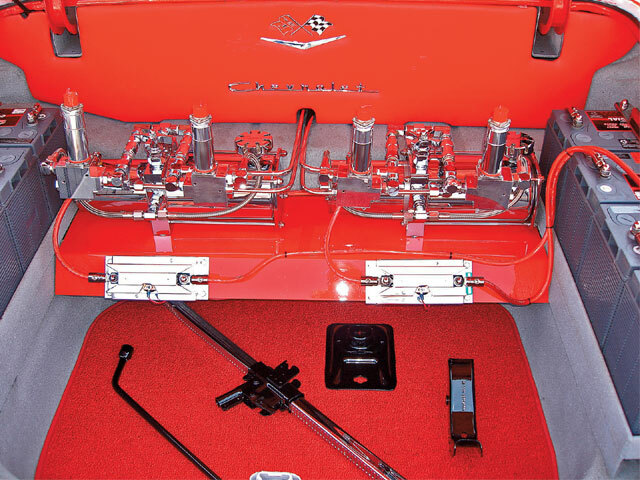 This time around, we’re featuring the audio in the trunk of his ’62 street ride, a car that he had built to roll to local shows or just go on Sunday cruises. Cartoon entrusted Mario’s Auto Works in Montclair, California, to do up his trunk. Cartoon let Greg and Adrian De Alba have full control and the result is a audio/hydro setup that’s worthy of our Bumps section. The car was lifted when it was dropped off at Mario’s, but Greg and Adrian decided that it would be good idea to relocate the old setup to make room for the audio that was going to be installed. 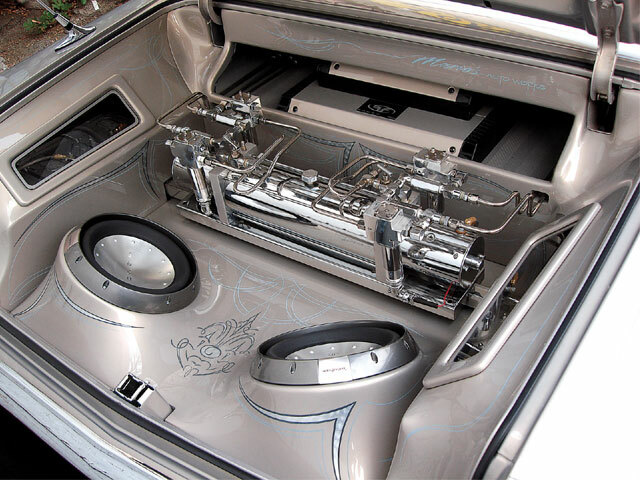 Giving it the best of both worlds, the car received two Rockford Fosgate amplifiers that push a pair of 12-inch Rockford Fosgate woofers as well as four 611/42-inch midrange speakers that are controlled by an Alpine head unit. The custom whammy tank was relocated and the four Adex square dumps are easily accessible. Talking about easy access, the batteries received custom panels with access windows to allow the batteries to be charged. 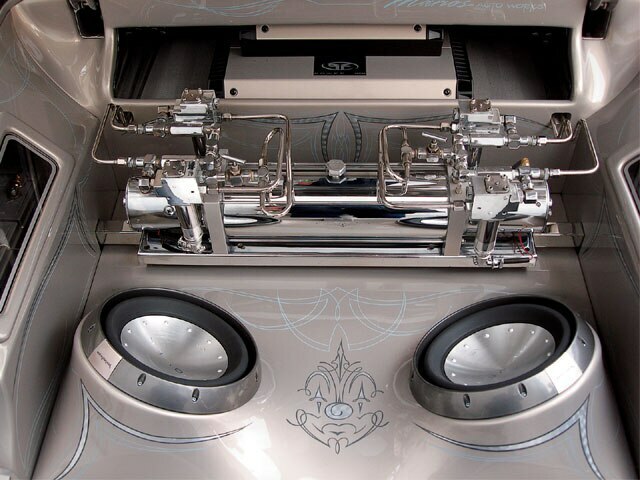 Once the panels and sound system were designed, they were painted to match the car’s exterior and then accented with pinstriping by Danny D of D&D Designs. The result is one clean audio/hydro setup by De Alba brothers. Keep up the good work and we can’t wait to see what you break out next. If you have a trunk that you think is worthy of a spotlight in our Dumps & Bumps section, feel free to e-mail photos and basic information to: saul.vargas@sourceinterlink.com.